The Marine Corps’ regional command in Afghanistan had the most violent activity in the whole country in the last six months, according to a new Pentagon report released to Congress. Regional Command Southwest was the site of about 8,000 “security incidents” from October 2010 to March 2011, said the biannual “Report on Progress Toward Security and Stability in Afghanistan,” released today (It’s posted online here). The incidents include attacks with direct fire, indirect fire, improvised explosive devices, mines and surface-to-air weapons. The region includes Helmand and Nimroz provinces, where more than 20,000 Marines are deployed. That’s not necessarily a surprise, considering Marine forces were involved in some of the heaviest fighting in the nine-year war in Afghanistan in and near Sangin district this fall. Security incidents across RC-Southwest have decreased since then, but there were still more than 1,400 there in January, more than 900 in February and more than 1,200 in March. The next most violent area was RC-East, which includes Kunar, Laghman, Paktika and several other provinces. About 4,800 attacks occurred there. RC-South, which includes Kandahar, Daykundi, Uruzgan and Zabul provinces, sustained about 4,000 attacks in the same period. Both regions are primarily patrolled by Army units. The other regional commands had significantly less violence, especially RC-Capital — Kabul — where there were just a couple each month. The report said the large number of attacks were to be expected, considering Marine and Army forces pushed into areas of southern Afghanistan where the Taliban had received little opposition in the past. Doing so “has proven challenging but achievable,” as the increased tempo of operations and a surge of coalition and Afghan forces expanded security and provided time and space for local Afghan government to develop, military officials said. 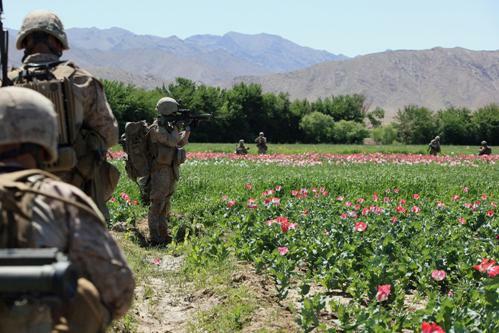 The Pentagon specifically noted some positive changes in Helmand. Sections of the provinces have improved security, the report said, with Nawa district progressing enough that the Afghan National Army took over a series of patrol bases from Marines in January. The report doesn’t mention it, but elements of 2nd Battalion, 3rd Marines, out of Marine Corps Base Hawaii, were reassigned to patrol parts of nearby Marjah district. In March, district elections were held there without any violence — unthinkable a year ago, just weeks after Marine forces first assaulted the area. Across Afghanistan, the surge of a coalition and U.S. forces last year led to improved security, the report said, but progress “remains fragile and reversible,” a common refrain for U.S. commanders providing assessments of the country’s future. Still, Pentagon officials agreed with previous assessments that security has improved enough for seven areas of the country to be turned over to Afghan forces this summer. One of them, Lashkar Gah, is in the Corps’ area of operations. The report also notes that the Taliban’s moment has been halted and much of their tactical infrastructure and popular support has been removed. However, it comes with a warning: “hard fighting” is expected through fall 2011. This ‘graph’ is just more proof that we’ve been there far too long. Someone takes the time, to build a nice Powerpoint graph, to be used in countless useless meetings, that does what for the Marine on the ground?! Bp, for what it’s worth, the report cost more than $300,000 to produce.